The northern snakehead has gotten a lot of press attention and has been called “Frankenfish.” It inspired a movie called “Snakehead Terror” about 8-foot long fish terrorizing a lakeside community, which helped create a common belief that snakeheads can walk on land. In reality, snakeheads are an invasive species that is spreading quickly through the Chesapeake Bay watershed. They eat anything that moves within their watery environment and they grow large. One saving grace is they make excellent eating and are often what’s for dinner for many fishermen. The use of any legal recreational gear is considered eligible for a Maryland state record in the invasive division of state records. A Virginia angler currently holds the world record for a hook-and-line snakehead at 17 pounds, 12 ounces. 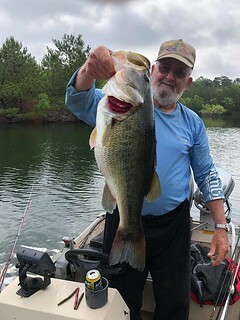 Maryland anglers have taken several larger than that with bow and arrow, including our new state record of 19.9 pounds set on May 24 by Andy Fox in Charles County. 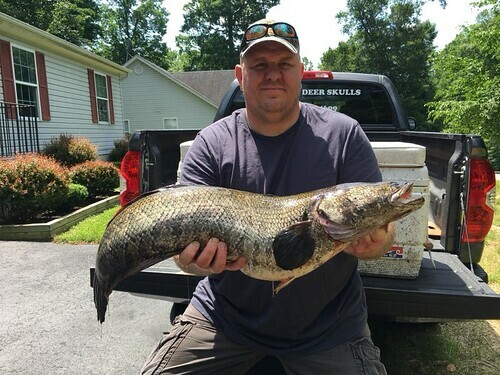 Now we need someone to top these records with hook and line and bring Maryland the bragging rights for the world record – so here’s a tip: Northern snakeheads are aggressive predators and nothing seems to drive them crazier than a buzzbait over or near grass beds. Don’t forget there are some free fishing days coming up June 9 and July 4. If you can think of someone you might like to introduce to fishing, this is a great opportunity for someone to try the sport without buying a license. Expect muddy waters to continue to reduce water clarity in most areas of Maryland’s waters. Anglers will experience mild, partly cloudy fishing conditions for most of this upcoming week. Bay temperatures have cooled slightly from recent cloudy, cool, rainy conditions to the lower 70 degree mark, but will slowly rise this week due to mild air temperatures and long daylight hours. Be aware that areas from Swan Point south to Plum Point are showing poor bottom oxygen conditions below about 20 feet. However, other portions of the main bay and tidal rivers have much better oxygen conditions, so be sure to check the full forecast and the Don’t Fish Below this Depth for conditions in your area. There will be above average tidal currents Sunday through next Tuesday as a result of the new moon on June 14. For the full weekly fishing conditions summary and more detailed and up-to-date fishing conditions in your area of the bay, be sure to check out Eyes on the Bay’s Click Before You Cast. 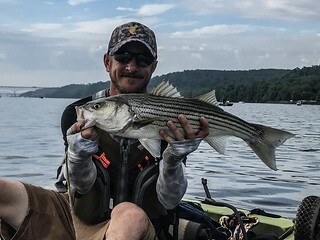 Despite some stained water in the very upper reaches of the bay, fishing for striped bass is very good in the lower Susquehanna River and the channels leading to the Susquehanna and Elk rivers. Since June 1 all areas of the bay and tributaries are open to striped bass fishing. The Conowingo Dam is currently in a power generating schedule that starts in the early mornings and lasts till the evening hours. The striped bass are being caught by those casting swimshads, bucktails and crankbaits but also by fishing with white perch. Some are live-lining them with circle hooks but others are taking freshly caught white perch and using them as cut bait with excellent success. Farther down the upper bay region there are excellent chumming opportunities for striped bass. Swan Point, Love Point, Podickory Point, and some of the shoal areas such as the 7-foot and 9-foot knolls have been good places to set up chum slicks or chunk. As is often the case, the largest striped bass are being caught in the back of the chum slick on baits left to sit on the bottom. A good tide is needed, and many report the last of a flood tide can offer some of the best fishing. Trolling is another good option in the upper bay, and the eastern side of the bay tends to have clearer water, so the Love Point area down to the Bay Bridge has been a popular place to troll. Mixed spreads of bucktails, swimshads, parachutes, spoons and umbrella rigs have all been popular. Dark colors, gold spoons and of course chartreuse have been doing well. Jigging is another good option along the channel edges with the 30-foot curve tending to hold the most fish. The Love Point channel edge and the Bay Bridge piers have been popular places to jig. Many are using 8-foot or more of soft plastic trailers in dark colors as well as pink with as light of a jig head as possible. 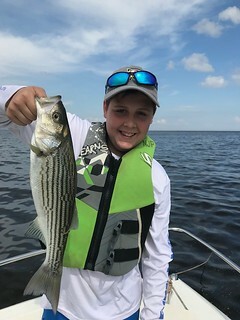 Striped bass fishing opportunities abound this week in the middle bay region, as surface water temperatures are in the low 70s and striped bass feel comfortable at most any depth and location. Trolling has been popular along the shipping channel edges and other prominent channel areas. A mixed spread of medium sized bucktails, parachutes, spoons and umbrella rigs are common. The eastern shipping channel edge south of the Bay Bridge past Bloody Point and all the way down to the CP Buoy has been a good place to troll. The western side of the channel in front of Hacketts Bar and Chesapeake Beach down past Parkers Creek has also been holding good numbers of striped bass. Jigging is a great option this week and light tackle anglers are enjoying plenty of striped bass action near channel edges, structure and anywhere fish can be spotted on a depth finder. The tributaries are open now to striped bass fishing, and some of the steep edges in Eastern Bay off Tilghman Point are great places to jig. Chumming is a very popular way to fish this week at many of the traditional locations. The outside edge of Hacketts, the Hill and numerous channel edges are great places to set up a chum slick or to do some chunking for striped bass. As is usually the case with chumming or chunking, the best grade of fish are coming from baits allowed to sink to the bottom at the back of the chum slick. Light tackle fishing in the shallower areas of the bay and tidal rivers has been spotty this week for those casting topwater lures in the mornings and evenings. Some days the fish are there and other times somewhere else. It is always a great time to be out on quiet water whether one is casting a popper with a spinning rod or skipping bugs with a fly rod. Many of the fish are just under or over the 19-inch minimum but are still plenty of fun either way. The rocks at Poplar Island and locations in all of the major tidal rivers offer good places to fish. This is a great week to be fishing for striped bass, as they tend to be spread over a wide area of the lower bay region. Trolling has been a popular option along the shipping channel edges and other prominent channels. The eastern side of the shipping channel from the CP Buoy down to Buoy 68 as well as the western side from Chesapeake Beach south to Point Lookout has been very good. The lower Potomac and Patuxent rivers are also good places to try trolling. There are a lot of borderline 19-inch striped bass out there and trolling tends to produce larger fish. Medium-sized bucktails, parachutes, spoons and umbrella rigs are good choices for trolling. Chumming and chunking has also been a great way to catch striped bass this week along channel edges. The rock piles just north of Point Lookout, the edge off St. Georges Island and Buoys 70 and 72 have been popular locations this week. Another great fishing option this week is jigging along channel edges or wherever suspended striped bass can be found on depth finders. There are a lot of striped bass holding in the lower Patuxent and Potomac rivers providing for plenty of fishing action. These fish are also providing a lot of fun light tackle cast action. In many areas there is good fishing from shore or in small boats. For example the fishing pier under the Route 4 Bridge has been a great place to cast bucktails and swimshads for striped bass. The cuts through Hooper Island are holding striped bass that can be caught by working bucktails or soft plastic jigs. The shorelines of both the western and eastern sides of the bay are providing good shallow water casting with topwater lures and scent enhanced soft plastic swimshads. The marsh edges of Dorchester and Somerset counties are wonderful places to find a mix of striped bass, speckled trout and a few slot-sized red drum. Fishing for white perch continues to good in the tidal rivers in all regions of the bay. Bottom rigs baited with bloodworms and fished over oyster bottom or hard bottom has been providing great fishing. Docks, piers and rock jetties provide structure for white perch which often hold close. Fishing these spots with simple bottom rigs baited with bloodworms or grass shrimp is a good way to catch them. Small jigs baited with the same will do the job also. Casting small jigs, spinners or spinnerbaits is a fun way to fish for white perch along shallower shoreline structure in the mornings and evenings. Recreational crabbing continues to be tough, with poor to fair catches prevailing in the upper and middle bay regions. The heavy runoff in the tidal rivers has driven crabs deep or to the lower regions of the rivers. The lower Eastern Shore tidal rivers and creeks of Dorchester and Somerset counties offer the best opportunity to catch crabs with trotlines or collapsible crab traps this week. Many of the rivers in the central and western regions have been exhibiting flood conditions with high and stained waters. Rivers from the upper Potomac to the Patapsco have generally been a mess for the last couple of weeks, and it appears more rain is predicted. The first consideration is to be safe out there. Deep Creek Lake tends to be in good shape and the walleye fishing there has been good. Most anglers are drifting live minnows along deep grass edges and steep rock edges in deeper waters. Large yellow perch and smallmouth bass is often part of the mix. Smallmouth bass can be also found on rocky flats and near structure. Largemouth bass tend to be in the coves near grass and structure such as fallen tree tops or floating docks. Northern Pike are being found at the mouths of coves often near deep grass. Department biologists and stocking crews have been busy this week with stocking trout in the western region. More than 4,500 trout were stocked in the North Branch of the Potomac and 1,000 in Bear Creek now that river levels have calmed down. Such is not the case at Patapsco Valley State Park where access to the Avalon area of the Patapsco River is closed due to flood damage. Most of the tidal rivers on the Eastern Shore are in fairly good shape when it comes to flooding. Water levels are up but not enough to curtail fishing, and water clarity is fairly good also. Largemouth bass fishing continues to be good this week. A falling tide is a great time to fish along the outside edges of grass and spatterdock fields with small crankbaits, jerkbaits and spinnerbaits. When the tide is up, fishing over grass and either spatterdock or lily pads with buzzbaits or frogs. When thick grass is encountered flipping stick worms or soft plasticsdown through the grass. Northern snakeheads will often be found in these same areas and it is pretty hard to beat a gold bladed and black buzzbait. At least one Eastern Shore tackle shop has been making these snakehead killers and they seem to be flying off the shelves. The lower Eastern Shore counties have an ever expanding northern snakehead population and fishermen seem happy to take them home for dinner. Blue catfish perhaps pose an even more expanding population issue as they reproduce and spread throughout the Chesapeake Bay drainage. The tidal Potomac tends to be ground zero and the river tends to be packed with them. The medium-sized ones make excellent eating. At present water temperatures are about 60 degrees in the surf and warmer in the back bay areas. There has been a mix of small bluefish and medium-sized black drum in the surf and large striped bass are beginning to show up and offer an exciting catch. The bluefish are being caught on cut mullet on cork float bottom rigs, black drum on clams or sand fleas and the striped bass on cut menhaden. Kingfish are being caught in the surf on bloodworms and small cut baits, blowfish and flounder tend to round out the mix. At the inlet and Route 50 Bridge area there are flounder to catch, and small to medium-sized bluefish have been moving in and out of the inlet. Striped bass are present but most are undersized. In the back bay area’s flounder fishing has been good in the channels leading from the inlet such as the Thorofare and the Sinepuxent Bay has been a great place to fish for flounder. Traditional baits of live minnows and squid has been working well and white soft plastics have been catching some of the larger flounder. Sea bass fishing has been very good on most of the offshore wreck and reef sites and captains are reporting that the best catches are coming from some of the deeper wrecks. Offshore species are being caught and some interesting catches came in to the docks last weekend. 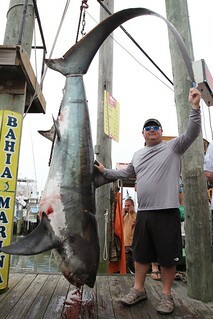 A 644.9-lb thresher shark was brought in by Nick Skidmore and two of his buddies while fishing in a 25-foot center console boat. Needless to say, they had quite an exciting day, with the shark being hooked at about 7 a.m., only 10 minutes after setting up baits and chum slick, followed by a fight of more than 2 hours on 60-pound test stand-up gear. 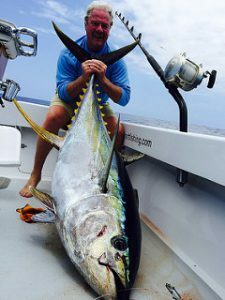 This was a noteworthy catch, but it can’t qualify as potential record because it was shot — which is legal and understandable for safety reasons, but makes it ineligible as a record fish by both the International Game Fish Association and Maryland Department of Natural Resources. A collection of bluefin tuna, large yellowfin tuna, bigeye tuna, mako sharks and some dolphin were also brought in over the weekend from areas around Poorman’s Canyon and 30-fathom curve sites.